Franklin Heights is a neighborhood in the City of Milwaukee between Capitol Drive, Burleigh Street, Twentieth Street, and the railroad tracks that run through the former A.O. Smith industrial complex. While sometimes the area south of Townsend Street is not counted as part of the neighborhood, this entry uses the broader definition. Franklin Heights started out as a farm community. It was connected to Milwaukee by the Cedarburg Road in the early 1850s. The road is now named Teutonia Avenue after the German, or Teutonic people, who settled in the area. A second road, Hopkins Street, was constructed a half mile west of Teutonia at about the same time, and Franklin Heights grew up in between the two streets. Franklin Street (now Vienna Avenue) ran east-west through the Franklin subdivision from which the neighborhood derived its name. At first, farmers used the two diagonal roads to bring produce to the city. 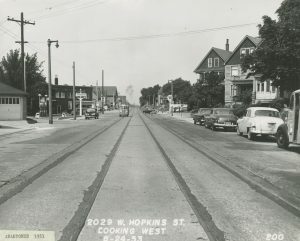 Once the Hopkins streetcar line was extended to Thirty-Fifth Street in 1899, city dwellers began to move to Franklin Heights. Additionally, A.O. Smith, which was one of the largest manufacturers of automobile frames in the world, outgrew its factory in Walker’s Point in 1910 and relocated to land along Hopkins Street. Its first factory there could produce ten thousand frames per day. Other factories followed, along with an office building and a research and engineering building. By 1930, A.O. Smith employed nearly six thousand workers on 140 acres of land. Those workers needed housing, and Franklin Heights grew rapidly. Lutheran, Catholic, Methodist, Evangelical, and Reformed German congregations constructed churches. Franklin Heights also had two public schools, Benjamin Franklin School, in the northern part of the neighborhood, and Auer Avenue School, in the southern part of the neighborhood. The ethnic and economic composition of Franklin Heights began to change in the 1960s. As freeways were laid in Milwaukee, many displaced residents chose to move away from Franklin Heights to newer neighborhoods to the north or west. As they left, younger, African Americans families moved into the area as they took jobs in the factories like A.O. Smith. Africans Americans went from less than 1 percent of Franklin Heights’ population before 1960 to 94 percent in 1980. A.O. 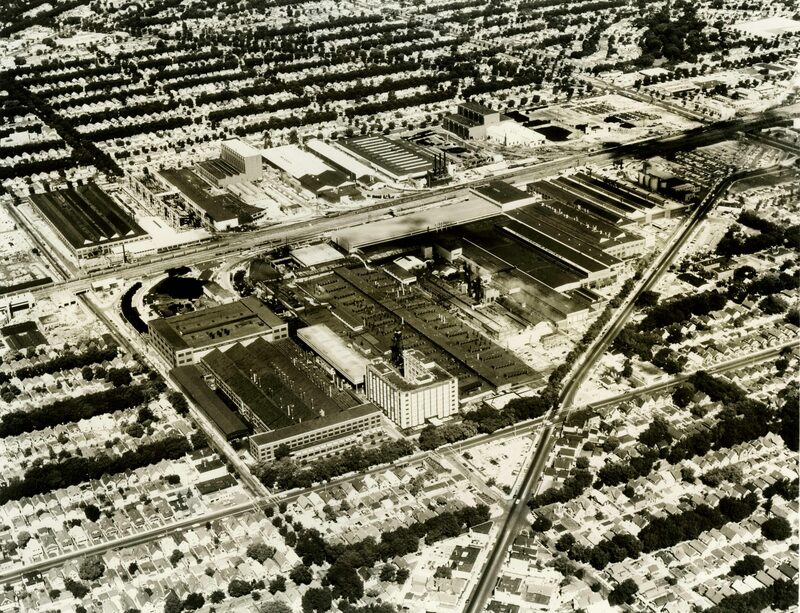 Smith continued to be the major employer until the 1980s, when it and other manufacturers along the Thirtieth Street industrial corridor experienced deindustrialization. A.O. Smith sold what was left of its business to Tower Automotive in 1997. Tower itself closed in 2006, leaving behind 140 acres of vacant land. Without its major employer, Franklin Heights saw an increase in poverty. The City of Milwaukee, however, has attempted to turn the neighborhood around through the Century City Business Park. The $35 million initiative began in 2009 with the goal of transforming sixty acres of the former A.O. Smith complex into a mix of light industry and offices with easy access to city streets and rail transportation. ^ City of Milwaukee, “Milwaukee Neighborhoods,” May 2000, last accessed December 25, 2015; John Gurda, Milwaukee: City of Neighborhoods (Milwaukee: Historic Milwaukee, Inc., 2015), 255. ^ Gurda, Milwaukee, 256-257, 260-261. ^ Tom Daykin, “Century City Building to Be Finished This Year at A.O. Smith Site,” Milwaukee Journal Sentinel, February 25, 2014; Tom Daykin, “Century City Project Progressing on the Northside,” Milwaukee Journal Sentinel, September 1, 2012; Tom Daykin, “Development, Coming to Century City Business Park,” Milwaukee Journal Sentinel, June 28, 2014; Tom Daykin, “Tower Site Will Make a Tough Sell as a Business Park,” Milwaukee Journal Sentinel, September 2, 2009; and Gurda, Milwaukee, 260.